On August 12, 2015, the Supreme Court of New Jersey decided the case of Cuiyun Qian v. Toll Brothers Inc., et als. In that case, the plaintiff and her husband resided in a unit in a community association in the Township of Plainsboro. All areas other than the dwelling unit itself were common property including the sidewalks and walkways, owned by the homeowners association and a recreation association. Homeowners within the community were charged monthly assessments for the maintenance of the common areas. The monthly assessments collected by the associations were to be used to pay for services such as snow and ice removal from the sidewalks because the governing documents of the community required the homeowners association to be responsible for the maintenance of the community’s common areas. Thus, the sidewalks at the community were private property included within the description of the common area of the property of the development and were not adjacent to public roadways. The sidewalks were not public sidewalks. In December of 2008, a snowstorm with freezing rain led to the accumulation of less than 2 inches of ice on the sidewalks and streets of the community. The landscape contractor, at the request of the association, salted the roadways but the contractor was not requested to salt the sidewalks and they were not salted or cleared. Two days later, additional freezing rain occurred. The landscape contractor did not apply any salt to the roadways or sidewalks that day. That afternoon, plaintiff and her husband walked through the community and the plaintiff slipped and fell on ice on a common area sidewalk within the community and was injured. (Luchejko v. City of Hoboken) decided in 2011. The Qian plaintiff did not like this result so she appealed the decision. The Appellate Division affirmed what the lower trial court had done dismissing the case against both the association and the management company, but did not issue a published decision. Still unhappy that her case remained dismissed, the plaintiff appealed further to the New Jersey Supreme Court. Upon review, the Supreme Court reversed the two lower courts’ determination regarding immunity and reinstated plaintiff’s complaint against the homeowners association and the management company. The Supreme Court reasoned in the Qian case that the duty of care that a residential1 landowner owes to a pedestrian on a sidewalk on or abutting his property depends on whether the sidewalk is characterized as a public or private sidewalk, not whether the owner of the sidewalk is considered to be a residential or commercial property owner. Thus, an owner of private property always has a duty to exercise reasonable care to protect those entering the property from dangerous conditions on the property. The Court’s decision makes clear that a duty exists to make private sidewalks and walkways reasonably safe and to the extent reasonable, to clear snow and ice that presents a danger to known or expected users of the sidewalks. Whether a sidewalk is public or private depends on who owns or controls the walkway. A critical factor in determining whether a sidewalk is public is whether the municipality has sufficient control over or responsibility for the maintenance and repair of the sidewalk. In the case of the homeowner association in the Qian case as distinguished from the Luchejko case, it was clear that the homeowners association had control over and responsibility for the maintenance and repair of the sidewalk, not the municipality. The importance of the recent decision by the Supreme Court in Qian v. Toll Brothers Inc. et als. is that while residential property owners are under no duty to maintain or keep the public sidewalk adjoining their premises free of snow and ice, residential property owners such as community associations are under a duty to take reasonable measures to maintain their private sidewalks in a safe condition. 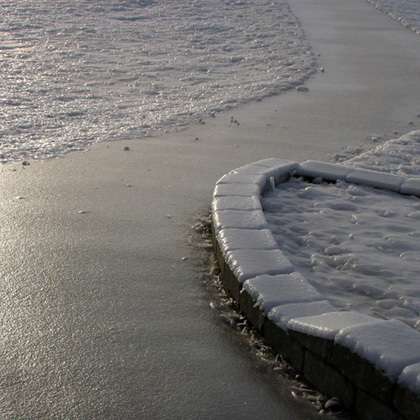 Residential property owners like community associations will be found liable for injuries caused by negligent failure to maintain their private sidewalks in reasonably good condition which includes taking reasonable measures to clear ice and snow. 1 Commercial landowners have more responsibility for maintaining public sidewalks adjacent to their property than do residential landowners. At common law, neither commercial nor residential property owners were under a duty to keep the public sidewalk adjoining their premises free of snow and ice. Neither commercial nor residential property owners were liable for the condition of the sidewalk caused by the elements. An exception was created by virtue of another Supreme Court decision in 1981 in which a duty was imposed upon commercial property owners to take reasonable measures to maintain and keep an adjoining public sidewalk reasonably safe for pedestrians, including the removal of snow or ice. The 1981 Supreme Court case of Stewart v. 104 Wallace St. Inc. rendered commercial property owners liable for injuries caused by negligent failure to maintain the sidewalk in reasonably good condition.